Medical chart holders, office file racks and wall mounted chart storage are available in a range of sizes and configurations. Keep important files, such as patient information, private with HIPAA compliant privacy chart holders from Wooden Mallet. Office files can easily be found with file holders that mount on the wall or that are freestanding organizers. Literature organizers make great teacher mailboxes or keep office letterheads in order. Single pocket holders are ideal for classroom attendance rolls, office memos or restaurant menus. 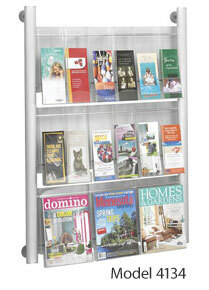 Magazine racks and brochure holders are a great way to present your office literature or waiting room magazines. Literature displays are ideal for hotel lobbies or other places that display pamphlets, travel maps or other periodicals. Rotating display racks hold a lot of literature, yet take up less space. Share an office? We also have business card holders that can hold multiple business cards at once. If you need help or have questions about any of our Chart, Magazine and Literature Racks, please call us at 800-599-6636 or use our Live Chat service.